On our wedding day I felt as any bride should: beautiful, confident, joyful. 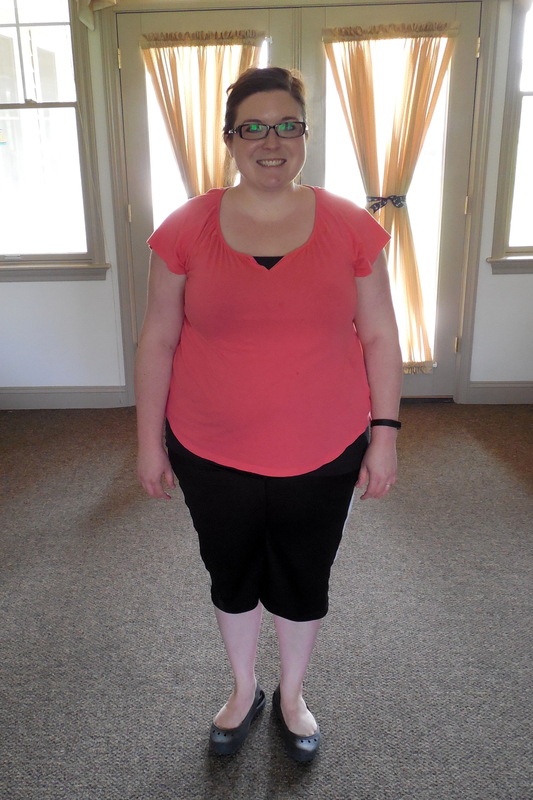 I had worked hard to lose twenty pounds before that day, and it felt so good to be thinner. Over the years I have lost the same amount of weight several times only to gain it back. 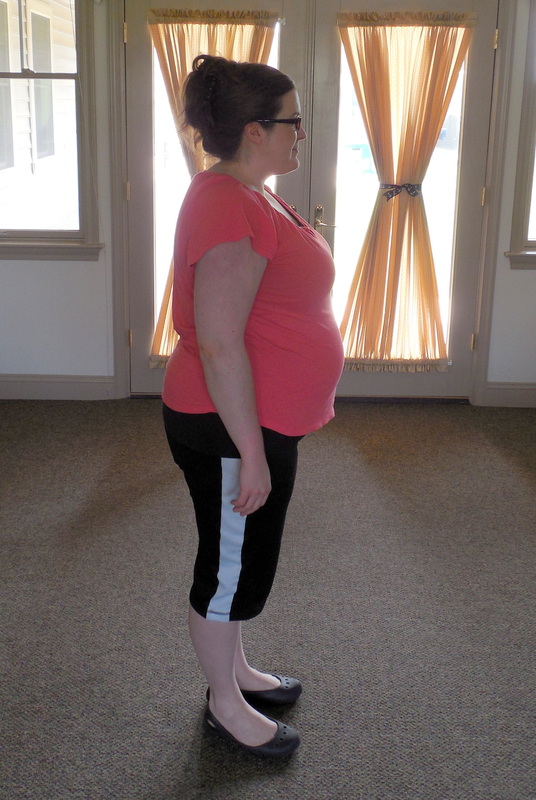 I gained over 30 pounds during pregnancy – pounds I hoped would melt away while nursing. Seventeen of those pounds did go away, but I am still carrying fifteen pregnancy pounds in addition to the fifty that I have gained since getting married almost five years ago. That is the minimum that I need to lose. According to the “charts” I need to lose 75-85 pounds in order to be a “normal” weight for my height. How did this even happen?! Before Tori got sick I was working on losing weight and I felt encouraged about my progress. But then our world was turned upside-down and I was forced into the role of full-time caregiver and nurse – a role I never imagined myself in, and one that requires all of my time and energy. It often requires more energy than I am able to give. I want so desperately to lose this weight and feel better about my outward appearance, but I lack the determination and energy required. I don’t get much sleep these days and that makes everything more difficult. I went shopping recently and couldn’t believe the size that fit me. It was a number I had never wanted to see. That experience was a reminder that I have to figure out a way to take care of myself AND Tori to ensure that I can continue to care for her with all of me. If I don’t eat this now, I may not have the chance to enjoy it again. It’s too hard to find the time to prepare healthy foods. I’ll just start again tomorrow. Everyone thinks I’m fat and that’s all they see. I’ll never be as thin as her, so what does it matter? So, I give up and eat what sounds good, what will make me feel good in the moment. I have so many things to constantly be aware of in regards to Tori that it feels good to be carefree in just one area of my life. And then I see photos of myself and I am appalled. Ashamed. I am reminded that I cannot just be carefree about what I eat – my genetics and my history tell me so. I find myself not wanting to see people I haven’t seen in awhile because I don’t want them to judge my weight. I try to hide it, and I try to avoid those situations to prevent embarrassment. Why is it that we try to hide the most obvious things about ourselves? It’s as if we are children in our Sunday best who have been playing in the mud, but we try to hide it from our parents even though it’s obvious that we are dirty. We try to hide our struggles because fear whispers that if we open up, if we are vulnerable, people will judge, criticize, and laugh at us. People will see how terrible we are and how greatly we have failed. The reality is that when we are honest, others feel the freedom to share their struggles as well. Vulnerability brings freedom. You know what really holds me back? Fear of failure. Instead of remembering that I have successfully done this in the past, I become intimidated by my current situation with Tori and all that it requires of me and I let that affect my attitude. Instead of trying, I give up before I even start. I have sacrificed the care of myself because I have convinced myself that I can’t fully care for Tori AND me. And that is a lie. Can I spend hours a day working out? No. Can I prepare elaborate healthy meals for myself and for Brennan on a daily basis? No. But I can start somewhere. And that somewhere is writing this extremely vulnerable post, because, as Jon Acuff so wisely said, “fear fears community.” Fear wants you to feel isolated, alone, defeated. Fear hates accountability and solidarity. But the power of fear is lessened when it is exposed to the world. I know I am not alone in this. I’m sure there are other women – especially in my shoes as a caregiver – who struggle with this very thing. And I want to figure out a solution because if I don’t take care of myself, how can I fully care for Tori? What am I going to do about this? I am going to take it one meal at a time and not be overwhelmed by the length of the journey ahead of me. Ice cream will be there when I reach my short-term goals and want a treat. I do have time to put together simple healthy meals and snacks. I won’t wait until tomorrow to start over – I will start immediately. I will remember that people are just as focused on themselves as I am and they likely aren’t focused on my weight, especially given my circumstances. I will stop comparing myself to other women. Thin doesn’t mean healthy. For me, it’s not just about the pounds – it is about overall health. I know that several women in my family have developed diabetes and I am terrified of that being my story as well. I’ve got to start now. I can’t change Tori’s condition, nor can I change the fact that she doesn’t sleep much (which makes me so tired all the time). But I can do one thing at a time to make progress. I can focus on what I DO accomplish as opposed to what I don’t. And I can be patient with myself and offer grace when I fall short. These before pictures are from July 4, 2015; not much has changed, yet, but that changes now. Good for you! You can do it. I needed this today as I need to lose some weight to get back into my favorite fall clothes. Your post was very brave! I was recently diagnosed with pre-diabetes despite having none of of the usual risk factors. I have completely changed the way I eat over the last 3 months and I would recommend taking it one day at a time. You may surprise yourself and find some new and healthy foods you didn’t even know you liked or learn new ways to cook/bake things in a healthier way. Sending encoragement your way!! Kudos to you Lesa for putting yourself out there. I know it’s really tough to lose weight and keep it off. The passion has to come from within, you really can’t do it for anyone but yourself. Healthy living is discipline but rewarding and can give you more energy you need for Tori. Start with some goals and you’ll be off to the races in no time! I am also struggling with my weight right now. I have gained 60+ lbs in the past 18 mths or so and it’s so hard to not eat what I want instead of what I should. I just had back surgery #5 and when you hurt, you take meds that make you fat and hungry, the pain gets worse, they give you more meds that make you fat and hungry and also throw in steroids about once a month. The lie I choose to believe is “it’s a battle I can’t win!” But if I’m honest it’s my love affair with pop tarts, or kettle corn or any other sugary gooey, or salty cheesy food my diet consists of. I have always been able to control my weight fairly easy…..gain 20, lose it, no big deal. But I missed the first 20 of these lbs I’ve gained, then the next 20 and by then it was oh well, I’ll lose them after surgery. Then surgery didn’t happen for another 6 months and on came another 20. I knew my clothes were tight and my pants weren’t fitting but it never registered just how much I had gained! Until it did….the fateful day I went to Old Navy for some new jeans. Ouch! I have a tub of jeans in the basement that tell the story of my weight gain. I am now 5 months post surgery and haven’t lost one pound. I’m still on the same drugs because it takes approximately a year to heal and there’s still pain from permanent nerve damage and arthritis that has set in. I’m still not able to do a lot of exercising yet and I still want those pop tarts! Those lbs didn’t just melt away after surgery like I thought they would, imagine that! As a matter of fact right after surgery I looked about 8 mths pregnant, smh. I had to have what they call a 360 cage and that partly means incisions front and back. The one on my tummy is about 7 or 8″ long and my tummy was swollen and pumped full of fluids and air! It was awful, none of my clothes fit, I had to wear my husband’s shorts and tees and the hospital sent a gown home with me, lol. That’s rubbing salt in the wound. So now that my sob story is out I will tell you I’ve struggled struggled STRUGGLED! I’m ok unless I look in a mirror or see a photo of myself and reality rears it’s truthful head, the weight is still there and I’m too afraid to get on a scale to see if I’ve added any to it, haha. Like you, I’ve decided ANY thing I do towards getting a handle on the eating or any exercise I get is a step in the right direction. I can now walk my dogs about 1/8 mile if I can sit every now and then to rest my back and silence the screaming it’s doing, seriously, its hard, but I now know I CAN! I’ve started eating better just with the fact I’m not having pop tarts every meal. When you hurt, eating anything that takes very long isn’t very appealing. With my back I can’t stay in any position very long. So, I’ve wrote all this to say thank you for sharing! I’m sorry you are having trouble losing weight and I’m especially sorry for the reason behind the lies you are hearing. I’ll pray for you now every time I’m reminded of my weight or pat myself for one of my small accomplishments. Miles apart we can do this together! Cheering you on. Just tonight in my bible study I heard, God doesn’t give a spirit of fear, he gives a spirit of power! Is it OK to cry at this post? I feel the same way! I can give every excuse but the truth is I love soda. I love that very rich and calorie filled coffee creamer in the morning! Thank you for being so vulnerable and posting this. I am also afraid of diabetes. Lesa, you are a true testimony not only in Tori’s life but your own. Thank you again for posting. I will be praying for you. My daughter’s pray for Tori all the time. God bless you. I stand with you in your journey to become a healthier you. I am in the same pants… Errr, boat! 😊 I hope you never feel ashamed again in your own skin, for you are God’s daughter, and He loves you know matter what. I think you are amazing, spirit-filled, genuine, and beautiful. Keep your chin up, and know that we all support and love you. I do not know you at all but your writing touched me so deeply. I wish you all the best and know that you will absolutely be successful it appears you have faced many many challenges but you face them with God. I think always …always you have to be in the right prepared mindsight to start and to cont to be successful and through your writing you can hear your sincerity and true desire to accomplish this. God is going to help you and see you through this next journey for YOU!!! Congratulations u already begun. You are so inspiring. The strength that you have shown with Tori is a gift from God, and He won’t let you down here. I know the struggle, but through Christ all things are possible. ❤️ So proud of you for taking this on. What an amazing article. I am so very fond of you. I really regret not getting to know you better when we were in school together. I will be praying for you and know that although there will be struggles that through Christ you will be able to overcome them. I understand your plight all to well. I have never been the “skinny” person. I find your post inspirational. Thank you for making yourself vulnerable to us all. As I’m sure you know no judgment of anything we do here on earth matters. What it really comes down to is how we lived for Christ. I have to say of all the godly women I know you are one of the best, my friend. I can’t wait to see where this journey takes you and I am excited to read your next post. Lesa you are awesome, and you are beautiful. Thank you for being vulnerable. I find reading your blog so encouraging and heartbreaking at the same time, your love for Tori shines through. I want to encourage you and give you a simple tip that has helped me to lose weight: watching portion sizes. I give myself much smaller portions than I used to and it was hard at first but I soon found I was getting full on less. It worked especially well for me with treats – when I get a bag of sweets I look at how many portions there are meant to be in the bag and split the bag into that many pots/food bags. (If I think the recommended portion has too many calories I do twice the number of portions!). Then I can have my little treat without eating the whole bag like I used to, I’ve satisfied my sweet tooth without feeling guilty later. It really helped me, I hope it helps you. As always, I am rooting for you and you and your beautiful family are in my prayers. You are amazing!! You are such a strong woman and role model. I needed to read this. I have been wanting to make a change as our embryo transfer is coming up and I need to eat healthier. I am 100lbs heavier than I was the day I tried on my wedding dress for the first time 5 years ago. Some of that is attributed to over eating and some is thanks to the lovely fertility drugs. Either way, I want to be healthier for my babies. You have motivated me to start today. Right now. We can support each other!